The KC7 Keypad includes an LCD-TFT display and back-lit, soft-touch buttons. It connects to the MC-66 or MCA-66 controller via Cat-5 (or Cat-5e or Cat-6) cable. Setup options include display color and brightness for both active and "sleep" modes, tone control for each zone, and the ability to edit the source names of each of your centrally located components (using the Valet Home Control app). Easily turn off all zones from a single keypad or turn on all zones to the same source for "party mode". IR pass-through enables control of centralized components from within each zone. Simply push one of the six soft-gel buttons to select the source you want to hear and control volume with similar up/down buttons. You can easily put the system into "party mode" by pressing a source button for seven seconds. All zones, whether currently turned on or off, are immediately switched to on and with that source selected. Volume in each zone returns to the last volume set in that zone. Enter "set-up" mode by pressing both volume buttons at the same time for three seconds. While in set-up mode, you can adjust treble, bass, and balance, adjust color for both background and text, and control the LCD screen's intensity when both active and in sleep mode (including turning the screen completely off). The keypad is designed to fit a Decora-style cutout. We provide an attractive "screwless" wall plate, but you can instead choose to install the keypad using your own Decora-style wall plate, including a multi-gang plate. 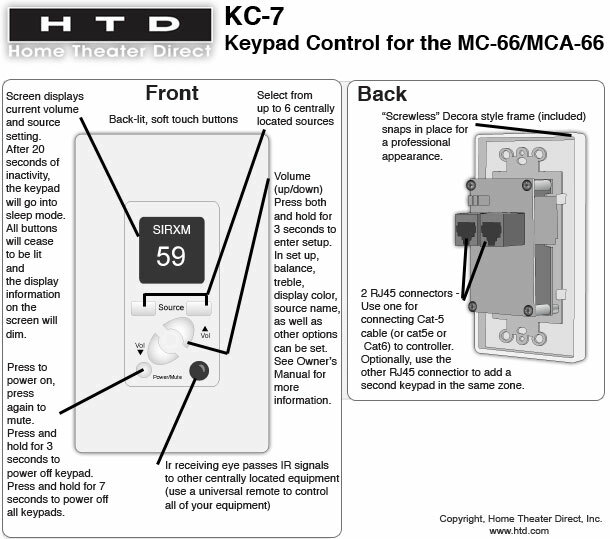 The keypad connects to the MC-66 or MCA-66 via Cat-5 cable (cat5e and cat6 are also okay). Each keypad includes two RJ-45 inputs so that up to four keypads can be "daisy chained" together in the same zone.